Did you know that April is Autism Awareness Month? 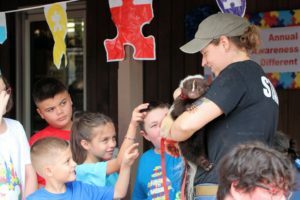 For the past four years, Animal World & Snake Farm Zoo has teamed up with the H.E.L.P. Autism group to host an Autism Awareness event. This event is full of fun activities like scavenger hunts, bingo, prizes, snacks, desserts, and of course, animal encounters! 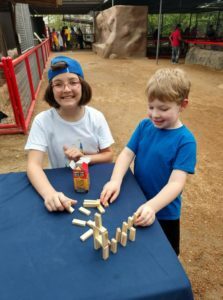 Our annual Autism Awareness Event is a chance for people with Autism and their families and friends to come together for a fun and relaxing day. We had a chance to sit down with some of the participants of this event and we asked them about the event. Alicia (right) handing out Door Prizes at the 4th Annual Autism Awareness Event. First, meet Alicia! She is the organizer of the whole event. Without her none of this would have been possible. She is a huge part of the H.E.L.P. 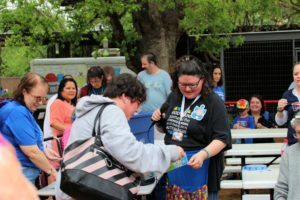 Autism group, which she describes as “a group of parents here in New Braunfels who organize fundraisers for a chance to reward our loved ones with Autism.” They put together prizes, goodie bags and events like these! 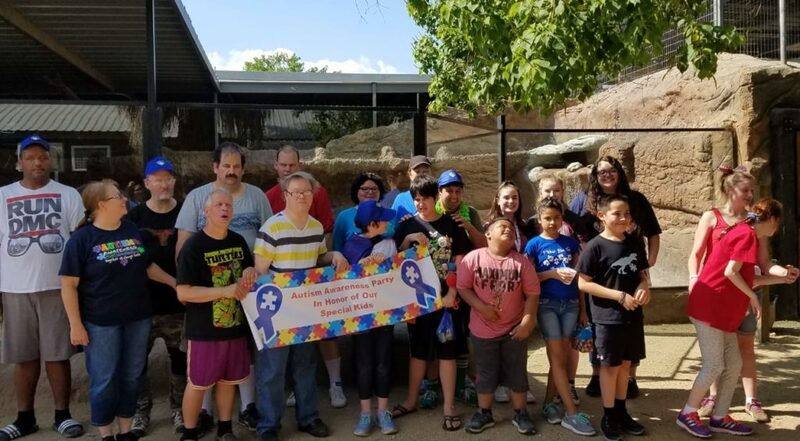 Although the group is just in New Braunfels currently, they hope to expand the group to other families outside of this area. Right now they have approximately 174 members. You can even check them out on Facebook! Jade helping her friend at the games table during the event. Next, we asked 10-year-old Jade, one of the participants of the event, to tell us a little about her favorite parts of the day. Jade has been to Animal World & Snake Farm Zoo many times before, so she knew her way around the zoo pretty well. She used her knowledge of the Zoo to help some of the other attendees with the scavenger hunt. Jade was also a big help when it came to planning the event. She was one of the first people there to help get everything set up. She also encouraged the other folks who were there (including her grandmother) to overcome their fears and pet the big Burmese Python. Mammal Keeper Chelsea introducing some of the event participants to Pepe the Skunk. He was a fan favorite during the Autism Awareness Event! This event would not have been possible without the incredible volunteers like Tom, Micayla, and Kaylee. Autism Awareness event participant getting up close and personal with Beans the Burmese Python.